In 1995, Albany-based artist Dahl Taylor was commissioned to re-illustrate the six-book Addy® series for American Girl, a venture begun in 1986, which combined beautifully produced dolls and historical fiction to become a national sensation. Over the next two years, Taylor worked with the American Girl staff to insure their vision and maintain historical accuracy. He found models for Addy and recurring characters in Albany. 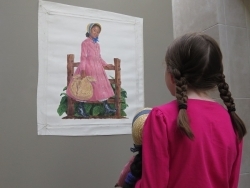 This exhibition presents more than forty paintings Taylor created to illustrate the story of Addy Walker, a nine-year old girl born into slavery who escapes to freedom with her mother during the American Civil War. It also includes artifacts from the museum's collection to illustrate daily life during the mid-nineteenth century.